Technology! I love it! I'm not very Techy, but I love learning how to use technology personally and in my classroom. Last weekend, my school was lucky enough to host the EdTech North State Summit featuring Google Apps For Education! It was a blast...but my brain worked overtime! By Sunday afternoon my brain was "googled" and pounding from all that I had soaked up! My goal for this conference was to learn how to best use technology in my classroom and to involve parents. With this as my focus, I went to my first session on Twitter. I have to confess, I've never been a big fan of twitter. What can I get from 140 characters? Well, that has changed! 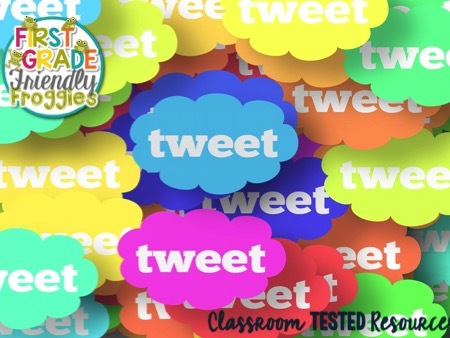 By Sunday evening, I had created a class twitter account and profile, invited my classroom parents to follow, checked to make sure I had permission to use pictures of my students, and began tweeting Tuesday morning! The parents enjoy seeing what we're doing during the day and it's quick and easy to share! I tweeted a video of the class GoNoodling and some pictures of the kids working on our current project! The kids love being recorded! So funny! I also found that I love twitter personally! I just had to follow the right people! Now I have great people in my feed who are tweeting valuable resources! I am reading more than ever now...one link at a time! Another app I discovered was FreshGrade. I'm just starting to use it, but love the potential I see. You simply create a class, individual student portfolios and snap pictures or make anecdotal notes! It's all in one place! Then you can invite parents to join and they can see what their child is doing on a daily basis. I've already recorded students reading, presenting to the class and their individual writing. My plan is to get more familar with the app, fill up the student portfolios with great work and evidence and present this to parents at conferences. Once parents sign up, they will have access to this information right away! I see this as a valuable tool for communicating with parents and sharing student progress! Those are all the techy tips I have for today, but check out my blog for updates! I plan to add more technology to my toolbelt! I am an elementary education major at Illinois State University, where I just attended a technology conference very similar to the one you mentioned in your post. At the conference, I attended a session all about techy ways to keep parents involved and got some really great apps and websites that parents and teachers love! Some of the resources we discussed were Class Dojo, Kidblog, Skype, Facebook, and Instagram. These sites were all suggested as ways to keep parents informed on what goes on in the classroom day to day. Class Dojo seems especially handy. It is a behavior management app that lets you set up an account for each student and then invite their parents to join. Parents can see how students are behaving throughout the day, and students can earn points and rewards. Thanks for sharing your ideas! It's always great to hear about new technological resources for the classroom! Thanks for the ideas and app recommendations. I always like to connect with other teachers and share the wealth!! Hi Emma, I'm forcing myself to use Twitter more and follow more people. Great post. Hope to learn more about FreshGrade.